Styled with aubri sweater and feuille pant . A relaxed silhouette and a super-soft, luxurious cashmere-wool blend make the Clermont a staple for cooler weather. The simple belted closure is a cinch, while the lapel features a hidden button for when things get chilly. Love the feel of the wool and the purple colour. 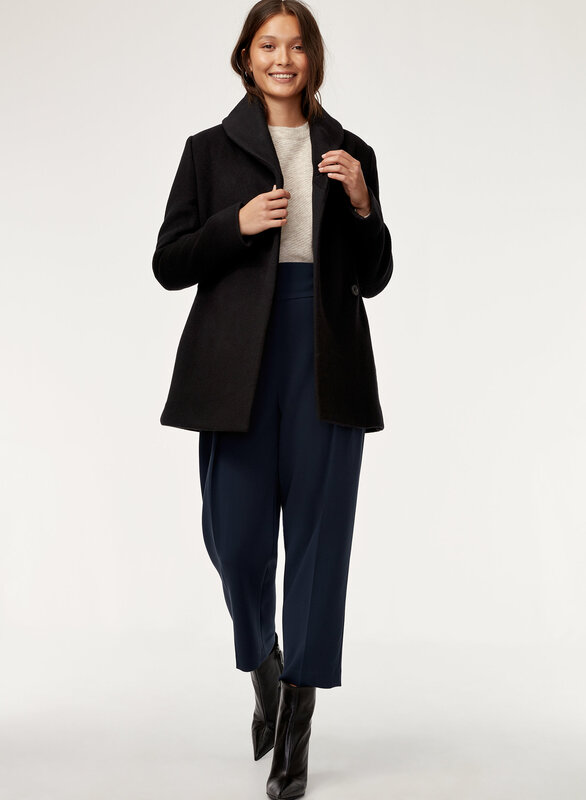 Fits well and tts- I am a small in Aritzia wool coats. !The neck is a little high so some may find it uncomfortable but it doesn’t bother me too much. The hidden buttons are a bit tricky to do up though. Other than that it’s a lovely coat and I’m happy I got it for more than 50% off. I bought this sleek coat in feather purple and I could not be happier. At first I was nervous that the neck was quite high, but it keeps me nice and warm. The quality is excellent and I highly recommend it. I wish I bought the medium size but In the details it had the sizing but it is smaller than listed. I am 5'1, it fits perfectly, warm and soft, it's my favourite coat this winter. I chose the lighter colour for a different option. I love pairing the light mauve colour with light jeans and creamy knits!